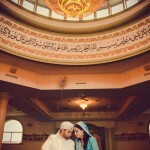 The first event our videographers and cinematographers covered on our journey together with Amanda and Ricky was the austere and solemn religious ceremonies of the couples’ traditional Sikh wedding marriage set in the Ontario Khalsa Darbar in Mississauga; one of the largest and most famous Sikh temples (‘Gurdwaras’) in Canada. For wardrobes, Amanda chose a gorgeous wedding-day ‘Shalwar kameez’ ensemble, while Ricky matching his beloved bride with his own ‘Sherwani’, with bride and groom both in matched beige and peach pink palette. The ceremony would commence early in the morning, with the formal Baraat beginning with Ricky, quite literally, arriving on horseback to greet his bride to be; truly a unique sight to behold, and one of the many scenes you can preview in the highlight reel included. True to Ricky’s ardent adherence to his cultural background, August 30’s events were very much ceremonial in fashion, yet never lacking in the distinct South Asian flair of a colourful atmosphere and a lively celebration, which always makes for many excellent shots for our videographers. For the second half of what would make Amanda and Ricky’s wedding complete, our videographers and cinematographers met the ‘partially’-newlywed couple a whole week later, on Saturday, September 6th. For this segment of filming, the couple chose a sentimental morning ‘first-look’ at the lush green scenery of Toronto’s Claireville Conservation Area, which offered many minutes of beautiful footage for the couples’ highlight reel. Amanda and Ricky would finally be wed in both religious traditions during the afternoon, in a catholic mass and wedding held at the Immaculate Conception Parish in Woodbridge. To close the event, a jovial reception and celebration was held at Woodbridge’s Chateau Le Jardin, with guests composed of the newly married couples’ closest family and friends. One part that our videographers were particularly proud of was the Next-Day-Edit we made for Amanda and Ricky, which was showcased during the reception. Our special video played through served as a bridge between the two events that made Amanda and Ricky’s wedding a unified whole, and indeed, was a bridge between the cultures that encompass the couples’ worlds together. 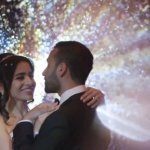 All in all, we here at SDE Weddings, Toronto’s premier wedding videography and cinematography group, were glad to be a part of Amanda and Ricky’s multicultural and multireligious wedding,. We were very happy to offer a unique window between two cultural worlds through our craft, and hope that Amanda and Ricky’s shared traditions continue to grow and flourish throughout their lives together. Updated on December 22nd, 2015: Here are the wedding highlight videos that we made for Ricky & Amanda. Day 2 Italian Wedding on September 6th, 2014.